With the opportunity to see some Arrol engineering in action, on 3rd September I headed towards Renfrew to see the span of the Inchinnan Bascule Bridge being raised for Doors Open Days. It was being raised 3 times during the day at 11am, 1pm and 3pm and I had chosen the earlier time thinking it would be less busy. Although, a large crowd had already gathered by the time I got there, I was not to be disappointed. Finding a clear viewing spot I was amazed to see the span of the bridge being raised to an almost vertical position in under 2.5 minutes. The bridge is on the outskirts of Renfrew and carries Inchinnan Road across the White Cart River. When it was built, the site required a moving bridge which would allow the passage of ships from the Paisley docks along the White Cart River to the River Clyde and out to sea, without too much disruption to pedestrians and road traffic crossing the river. Bascule bridge as it lifts: showing the long span counterbalanced by the weighted block. It is a Scherzer rolling lift bascule bridge and was designed and built by Sir William Arrol & Company Ltd. in 1923/4. A bascule bridge is a moving bridge with an extended span at one end counterbalanced with a heavy weight at the other. Because the span is counterbalanced it requires very little energy and little time to raise it upwards into a near vertical position. The rolling lift design was patented by William Donald Scherzer, an American engineer who wanted to refine the bascule design that was used by Sir William Arrol at Tower Bridge, London. Instead of having a fixed pivot point taking the weight of the bridge, the rolling bridge has a large radius roller which moves on a track and as it moves position the centre of gravity shifts to the point of contact with the track. To prevent slippage the track has guide blocks which align with matching pockets in the roller. The bridge rollers: showing the holes that follow the blocks on the track. Note the mass of rivets along the edge of the roller where additional steel plates strengthen it. as the bridge is lifted it moves away from the water channel offering the full width of the channel for passage of ships. the shortest possible span length can be used for the closed position. the simple design is cheaper to construct and maintain. less power is required to overcome rolling friction and so it is cheaper to operate. Inchinnan Bascule Bridge: east bank showing the cabins and outbuilding. The cabins on towers flanking the bridge contain the lifting mechanism. It is powered by electricity and should the supply fail there is a back-up generator in the outbuilding. It is the only surviving rolling lift bridge in Scotland and in December 1994 was designated Category A listing. In 2004 Renfrewshire Council commissioned a complete restoration of the bridge and operating mechanism at a cost of over £1million. The works involved repairing parts that had deteriorated, strengthening the structure to carry the increased loads of today’s roads, painting with a new protective coating and adding architectural lighting. Although the days of large ships navigating the White Cart are past, the bridge still has to remain operational to allow the passage of large components downriver, from the Doosan Babcock Ltd engineering firm to the sea. 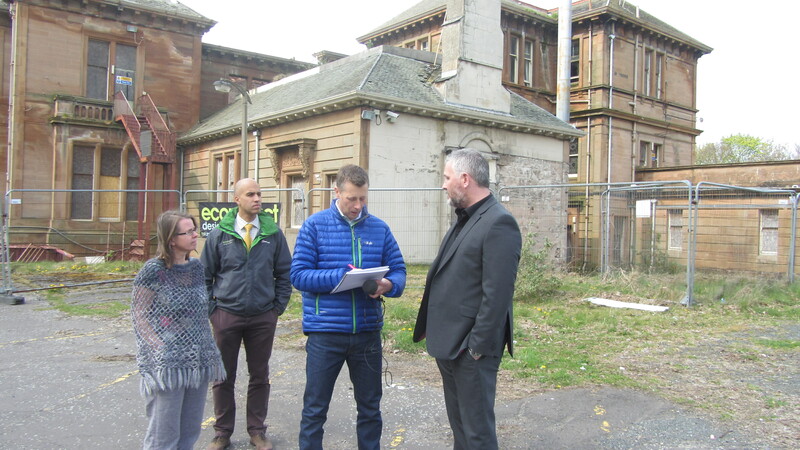 It has also become an annual event for Doors Open Days programme in Renfrewshire attracting a large crowd curious to see the bridge in action and relive the memory of a not-quite bygone age. Internet Archive: “Scherzer Rolling Lift Bridges Their Inception Development And Use” (1916) The Scherzer Rolling Bridge Company. Forth Bridge, Tay Bridge and Tower Bridge, are the three most famous steel structures built by Sir William Arrol & Company Ltd. and are celebrated internationally. But the company also built many lesser-known structures, which although perhaps not such significant feats of engineering, were still important in the development of the Scottish railway network. I wanted to find out about other Arrol bridges and where better to start than in Glasgow, where the company was based. Bridges, structural steel work, and mechanical engineering productions, published by the Company in 1909, lists the principal bridges they built between being established in 1872 and 1907. It lists 18 Glasgow city centre railway bridges and when I set about plotting them on the map a very simple walking route emerged. The more I researched, however, the less simple it became. Over the last 100 years some street names had changed and alterations had been made to the railway lines and road layouts making it difficult to know which of the remaining bridges could be attributed to Arrol. Using the National Library of Scotland’s online georeferenced overlay maps I was able to follow the railway lines and compare the exact position of the original bridges from old maps with an overlay of current satellite images. Using these and the observations I made during a preliminary walk of the route I managed to work out which Arrol bridges, or traces of them, could still be seen. The walk starts at Central Station and follows the route of what was the Caledonian Railway line heading south across the River Clyde. At Salkend Street the Caledonian line is crossed by the Glasgow & South Western Railway’s Union Line and from there the walk jumps track to follow that line towards the Gorbals and then back north across the river. In total the circular route is less than 3 miles long and will take about 1-2 hours to complete, depending on how long you stop at each bridge. Download a 6 page pdf of the route description. Central Station was built by the Caledonian Railway in 1879 to extend the existing railway from the terminus at Bridge Street Station and provide a more convenient city location north of the River Clyde. However, by 1890 the 8 platforms of the station were struggling to cope with the volume of passengers and so the station was expanded between 1901-1905 to provide 13 platforms. The establishment of the station and expansion meant that new railway bridges were required to cross the river and streets below and many of these were built by Sir William Arrol & Co. Leaving the Argyle Street/ Hope Street exit from Central Station you pass by the ornate glass panelled walls of the Hielanman’s Umbrella which supports the platforms above Argyle Street. The bridge is so called because it was used as a meeting place for the gaelic-speaking highlanders who moved to Glasgow in the 19th century in search of work and provided shelter from the wet weather. Although it is not an Arrol bridge its nickname is very apt as my preliminary walk was carried out on a very showery day and I had to take full advantage of numerous bridges as umbrellas. Walking down Oswald Street towards the river, the first Arrol bridge we come to, is the next bridge along the line, over Midland Street. It was built by Sir William Arrol & Co. in 1901, over what was originally known as Ann Street, as part of the expansion of Central Station. It is a simple single span bridge of 46 feet in length. Midland Street Bridge, built 1901. Continuing down Oswald Street we arrive at the Broomielaw with the Caledonian Railway Bridge on the left. This is the second Caledonian Bridge and was built next to the first bridge to carry a 9 track railway across the river and 2 adjacent roads into the station. It was designed by Donald A. Matheson, chief engineer of the Caledonian Railway and built by Sir William Arrol & Co. between 1899-1905. The side view of the bridge, with elegant curved brackets supporting a lattice-work parapet, belies the heavy network of massive steel girders and criss-crossing supports that you see when you pass underneath the bridge, along the Clyde Walkway. The steel superstructure is supported at each roadside by 6 cylindrical piers and in the river by 2 wide rectangular arched piers and despite the noise from traffic and trains above has a stillness and cloister-like atmosphere when viewing the piers across the river from underneath. On the other side you can will see the remains of the original 4 track railway bridge, designed by Blyth and Cunningham engineers and built by Sir William Arrol & Co. between 1876-1878. The track and girders were removed in 1967 and all that remains of it today are the supporting paired piers linked by cast iron arches. You can study these in more detail as you walk across Glasgow Bridge over the River Clyde. In celebration of Glasgow European City of Culture in 1990 the sculptor Ian Hamilton Finlay created an artwork of the piers inscribing the words “ALL GREATNESS STANDS FIRM IN THE STORM”, in English and Greek, into the granite piers. Piers and steel arch of the 1st Caledonian Railway Bridge, built 1878. Continuing straight along Bridge Street look to the right at the next road junction where you will see the Kingston Street Bridge. Built by Sir William Arrol & Co. in 1906 for the expansion of the Caledonian line. Although not as elegant as the Caledonian Bridge, it has some similar features, like the curved brackets which support the parapet of steel plates topped with lattice-work. Kingston Street Bridge, built 1906. 4&5. While walking along Bridge Street towards Nelson Street note the blonde sandstone building with 4 archways flanked by doorways, what was the second Bridge Street Station built in 1890. The next two bridges along the line, at Nelson Street and Wallace Street, also built by Sir William Arrol & Co. in 1906, are of the same design as Kingston Street Bridge. Walk underneath Nelson Bridge to study the girderwork spanning the street and then turn left onto Commerce Street to get to Wallace Street. Nelson Street Bridge, built 1906. Wallace Street Bridge, built 1906. Continue along Commerce Street and at the T junction turn left onto Cook Street. By this point the railway line has split with one route heading west and the other continuing south, which our walk will follow. Take the first right onto Salkend Street, running adjacent to the railway line, and walk towards the railway bridge which crosses over the street and Caledonian Railway line. This bridge is very different to those preceding and is an earlier bridge, built in 1870 when the Glasgow & South Western Railway’s (G&SWR) Union Line was first developed. Like the Caledonian line we have been following, the Union Line was expanded in 1899 and Sir William Arrol & Co. built the bridges to carry the new tracks across the road network. After 1966 when passenger services on this line were stopped, two of the tracks went out of use and some of the bridges were removed, including the ones Arrol built at Salkend Street and Eglinton Street. You can still see the stone piers from the Arrol bridges on the north side of the Salkend Street Bridge. 1870 Salkend Street Bridge – the stone pier seen in front of the bridge shows the location of the 1899 Arrol Bridge. Looking across the railway line you can just see the curve of the Eglinton Street Bridge. To get to it you first have to continue up Salkend Street to Kilbirnie Street where you turn left underneath the M74. The modern concrete and steel construction of the motorway viaduct, opened in 2011, is an interesting contrast to the 19th Century engineering of Arrol. Follow the railway line down the other side along Eglinton Street until you come to the bridge, where again you will see the stone piers of that would have supported the Arrol bridge. 1870 Eglinton Street Bridge – the stone pier seen in front of the bridge shows the location of the 1899 Arrol Bridge. Walk down to the Eglinton Street Bridge and turn right before passing underneath it. From here we follow the G&SWR line heading east and all of the bridges that remain along this stretch of line were built in 1899 by Sir William Arrol & Co. At each bridge you can still see traces of where the original bridges were removed. Follow the peaceful pedestrian walkway on the south side of the railway line towards the Abbotsford Place Bridge. Abbotsford Place Bridge, built 1899. Continue along the walkway to Salisbury Street and pass underneath the bridge. Note the two levels of the bridge. The lower level carried the railway track and the higher level carried the platform which was reached from Cumberland Street Station, to the east of the bridge. Turning right you can see what remains of the derelict red sandstone station building. Salisbury Street Bridge, built 1899. Continue along Cumberland Street to the next bridge which crosses both Cumberland and Surrey Streets. Note the steel pillars used to provide additional support to the bridge as it traverses the corner junction. From here you get good views of the bridges along the viaduct. Cumberland/Surrey Street Bridge, built 1899. Continue to follow Cumberland Street under the bridge and turn left onto Gorbals Street, originally called Main Street. Note the similarity between the Cumberland and Gorbals Street bridges with their bow-shaped latticework parapets. Gorbals Street Bridge, built 1899. Follow the pedestrian walkway alongside to the viaducts to the bridge at Cleland Street, originally Greenside Street Bridge. From here you can very clearly see where the 1870 bridge has been removed and the unused tracks are now overgrown with trees. The bricked-up archways underneath the bridge display a permanent exhibition about 3 famous people born in the Gorbals, Hannah Frank, Benny Lynch and Allan Pinkerton. Pause here to study the historic Maclure & Macdonald’s map which shows the route of the 1870 railway line through the Gorbals. Continue to follow the viaduct along Cleland Lane which veers to the right along the route of what used to be Rutherglen Road. Unlike the other railway bridges this one has retained its old name and is known as Old Rutherglen Road Bridge. Old Rutherglen Road Bridge, built 1899. Passing underneath the bridge leads onto St. Luke’s Place and turning to the left you will see the next bridge, at Ballater Street. Ballater Street Bridge, built 1899. 15. Pass underneath the Ballater Street Bridge and continue straight ahead to Gorbals Street where you turn right and follow the road back to the River Clyde. At the river turn right onto the walkway from where you will see the final railway bridge and one of the most impressive of our walk. This is the Union Railway Bridge which was built in 1897-9 to replace the 1870 2-track bridge. It was designed by William Melville, Engineer to the G&SWR. 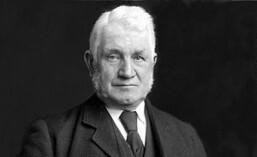 Sir William Arrol & Co. were contracted to do all the steelwork and Morrison and Mason the foundations and masonry. The bridge carries the railway line over the River Clyde and the 2 adjacent roads on the south and north banks, which were known as Adelphi Street and East Clyde Street. The section crossing the river is a 5-arched steel structure supported on stone piers with red sandstone half-turrets decorated with crenellations and arrow slits. Each of the latticework steel arches has a decorative cast-iron cornice and parapet. The abutments on each bank are in red sandstone, matching the medieval styled piers, but with much larger full turrets. The single spans of the bridges over the roads are of plain latticework. The Bridges, structural steel work, and mechanical engineering productions book lists a further 2 bridges built by Sir William Arrol & Co. for this line before it entered St Enoch Railway Station. These were at Dunlop Street and Stockwell Street but, like the Station itself, these were demolished to make way for the St Enoch Shopping Centre and no trace of them remains. From here you can follow the Clyde Walkway along the river and return towards Central Station and another opportunity to see the Caledonian Bridges from a different angle. Alternatively you can follow the river east through Glasgow Green, as I did, and visit The People’s Palace. This museum has a couple of interesting Arrol items from the Dalmarnock Iron Works on display. One is a marble bust presented to him by his employees in 1888 on completion of the Forth Bridge, the other is a brass plaque from his employees commemorating his death in 1913, both symbols of the high esteem in which he was held. As part of the Totally Thames Festival in September there will be a novel opportunity to see some of Sir William Arrol’s engineering, inside the Tower Bridge bascule chambers, whilst listening to a performance of Iain Chamber’s composition “Bascule Chambers”. All the steelwork for Tower Bridge was manufactured by William Arrol & Co. Ltd. in Glasgow and shipped down to London for construction. Bascules are the steel sections of the bridge which lift to allow passage of tall ships underneath. The bascule chambers are massive, brick-lined spaces which house the counterweights that enable the bascules to be raised. Iain Chamber’s composition is based around the sounds made as the bascules are raised, so essentially the bridge becomes the musical instrument and is supported by 4 brass players. The premiere of the composition will be the first ever public performance inside the chamber. Sir William Arrol was very fond of music and often held live performances in the large wooden panelled hall at Seafield House. 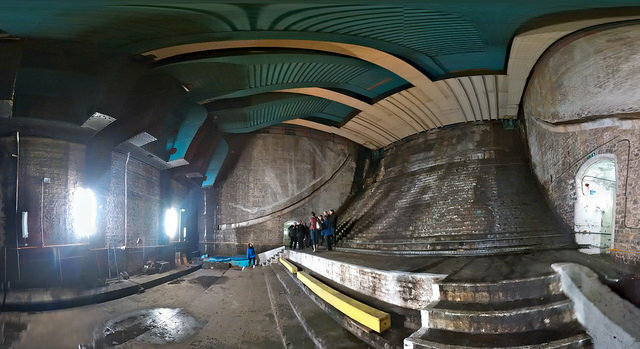 I don’t suppose that, as he supervised work on Tower Bridge, he ever imagined that the chambers would be used as a venue for a musical performance although he may have commented on the acoustics of the cave-like space. Performances of “Bascule Chambers” are being held on 26th and 27th September. Further information can be found on Iain Chamber’s website and the Tower Bridge Exhibition website. 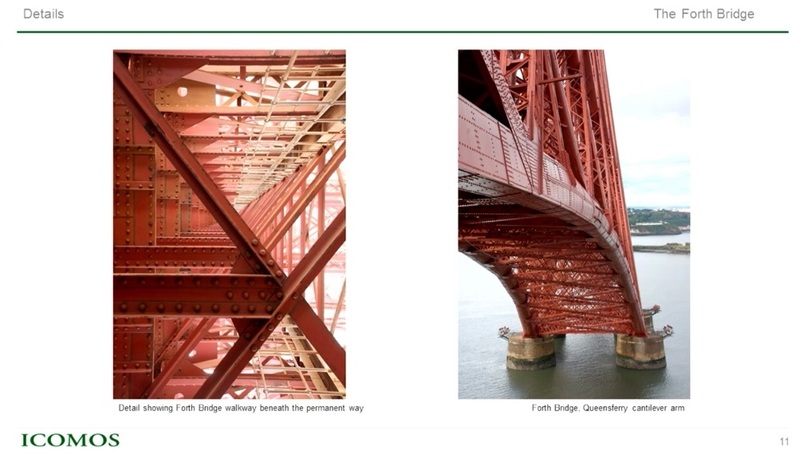 The Forth Bridge was inscribed as a UNESCO World Heritage Site at the 39th session of the World Heritage Committee today in Bonn, Germany, making it Scotland’s 6th World Heritage Site. Discussions started with a presentation by ICOMOS (International Council on Monuments and Sites) which described the situation, bridge structure and context of the bid in relation to the criteria for OUV (Outstanding Universal Value). It was proposed that the bridge be inscribed under critera (i) and (iv). Members of the committee also praised the quality of the nomination documents, saying how well prepared they had been, concise and convincing and to be held up as an exemplary for future bid submissions. Some concern was shown over ensuring protection of the views and of the structure itself. ICOMOS commented that a report was being mapped out for submission by 31 December 2015 which would review the immediate environs of the bridge and a radius of 20km around it. This would identify main vista points and ensure that controls were in place to favour protection of the bridge and the lines of site around these vistas. 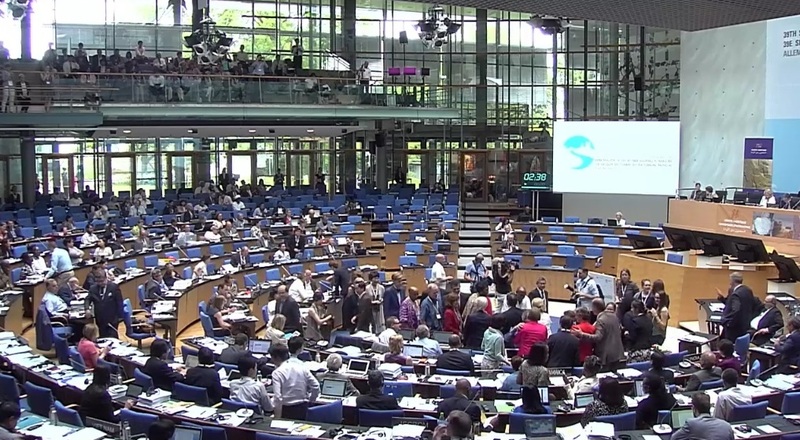 Footage of the meeting can be found on the Records webpage of the 39th session of the Committee for Jul 5, 2015. An original Arrol hydraulic riveting machine was unveiled at the Institution of Civil Engineers (ICE) Museum Scotland on the evening of the 27th March, in celebration of the 125th anniversary of the Forth Bridge being opened. The riveting machine was designed by William Arrol to be used on bridge construction sites to give strong, consistent riveted joints. The riveter was suspended from a crane and could be used in a vertical or horizontal position. 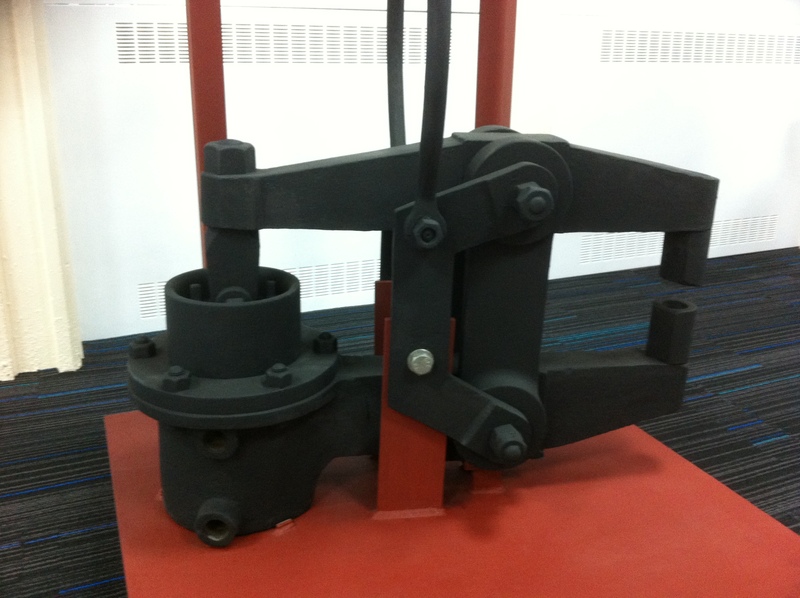 Power to drive the riveter was from hydraulics using compressed water. Riveters like this were used to drive home many of the 6.5 million rivets used to construct the Forth Bridge. Read this ICE leaflet for more information about the riveting machine. The ICE Museum Scotland is housed in the Sir William Arrol Building at Heriot Watt University, Edinburgh and holds a collection of almost 400 items relating to civil engineering, including a number of items relating to Sir William Arrol and the Forth Bridge, including a one quarter scale model of a double cantilever skew-back from the Forth Bridge. 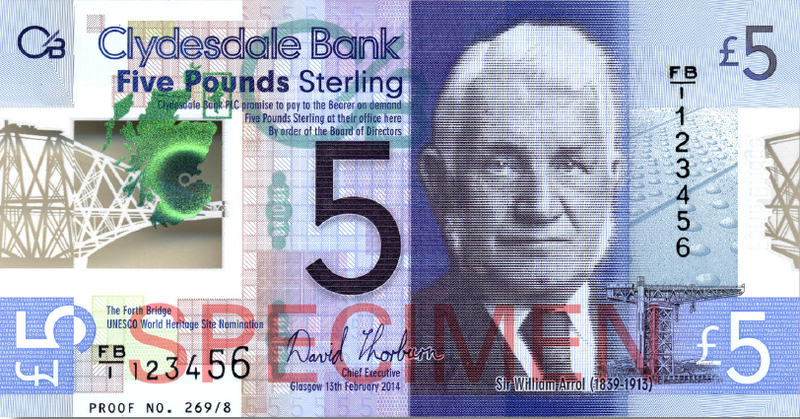 Following their launch on 22 May last year of their new polymer £5 note featuring a portrait of Sir William Arrol and the Forth Bridge, the Clydesdale bank have now released the note into circulation. On 26th March the Clydesdale bank released the note, the first British polymer banknote, to commemorate the 125th anniversary of the opening of the Forth Bridge. The note also features the Titan Crane, another of Sir William Arrol’s great engineering achievements. See the Clydesdale Bank website for further information about the polymer banknote.